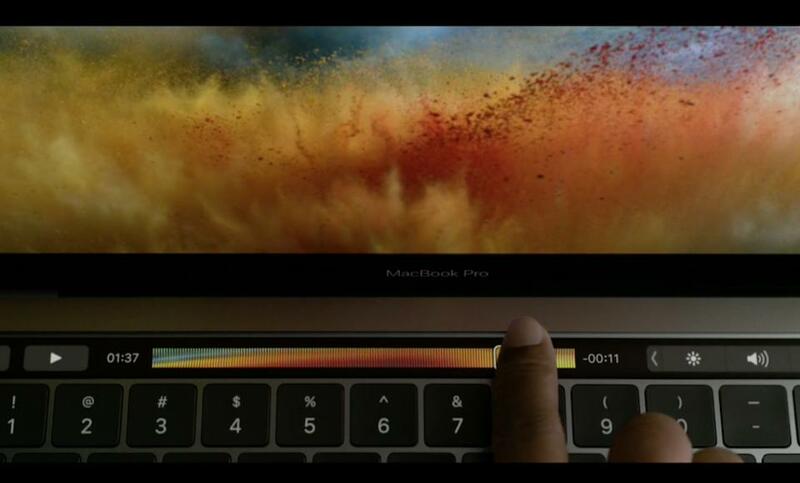 With the sole exception of the touchscreen key strip that replaces the function keys, there’s pretty much nothing that interesting about the new Macbook Pro machines from Apple. That is not to say they are not nice machines, but they are a bit under-specified for a “pro” laptop tag, although I suspect that quite a few people complaining about the lack of a dedicated GPU in the 13″ model fail to realise that most serious professionals do most of their heavy number crunching in the cloud and not on a light-weight laptop. And frankly any laptop is light-weight compared to a rack-based server with a case full of Teslas. A laptop is essentially a creative tool for accessing “the cloud” for anything that requires a real computer, and a 13″ Macbook Pro is fine for that (although the trendy tax is a touch high). And the ill-fated Apricot Computers had a competitor to the IBM PC which came with a keyboard that had six “soft keys” with LCD panels. So Apple has not done anything new here, but when did they? Their core skill is taking technical innovations and making them user-friendly; I don’t have a problem with that. This keyboard could be useful in many ways – in addition to resurrecting the old “function key labels” in a more usable way, there is also the possibility of using them to insert symbols that we should be using, but rarely do so because they are not to be found on our normal keyboards. Depending on your proffesion (or inclination), we have different symbols we could or should be using – perhaps the copyright symbol ©, the interrobang ⁤‽, or more. Of course how useful it becomes will be down to the relevant software developers. I have been looking into a problem with my Macbook Pro for quite a while now – despite setting the preferred sleep mode with sudo pmset -a hibernatemode 1, the laptop refuses to go into hibernate mode. It doesn’t even go into hibernate mode when the battery runs down sufficiently that it should do. On occasions, the battery runs down enough to loose all power meaning my laptop switches off, and all running programs are terminated. Also the laptop sometimes comes out of sleep mode in my backpack getting very hot in the process. According to a comment on a blog posting, there may be an issue with Firefox preventing hibernation from working – why that should be, I haven’t the faintest idea. Despite seeming a touch unlikely, I gave it a go – quitting Firefox and then putting the laptop to sleep. However it turns out that stopping Firefox doesn’t prevent my main machine from hibernating. After a long hunt and several experiments, it turns out that OSX will simply not hibernate to a disk that isn’t in the slot where the hard disk is. Or in other words, you cannot hibernate when your boot disk in an SSD in the ExpressCard slot. Which strikes me as a bit … weird. I guess the fix for this would be a proper SSD in the hard disk slot and to move the hard disk elsewhere. After having invested in an SSD and spent far too long forcing my tired old eyes to operate in my MBP, I can confirm that hibernation does work with any kind of disk in the right slot for the hard disk. Apologies to those arriving here looking for information relating to U***tu and the use of this ExpressCard SSD. There is nothing relating to it here – Google has taken you on a wrong turn. So after a false start with the wrong product I end up with a Wintec Filemate SolidGo 48GB ExpressCard 34 Ultra SSD (which is specifically a PCI-based ExpressCard rather than a USB-based one which tend to be a lot slower). The specs on this thing claim 115MB/s read and 65MB/s write which compares to my hard disk with tested scores of 80MB/s read and 78MB/s write – so a lot quicker for reads and marginally slower for writes. How does this translate into how quickly the Macbook operates ? Well apart from the slightly surprising result of the time taken to get from the Refit menu until the login screen being actually quicker for the spinning metal disk, the SSD is approximately 3.2 times quicker! Certainly a worthwhile performance boost … and presumably a suitably chosen SATA SSD would be quicker again.